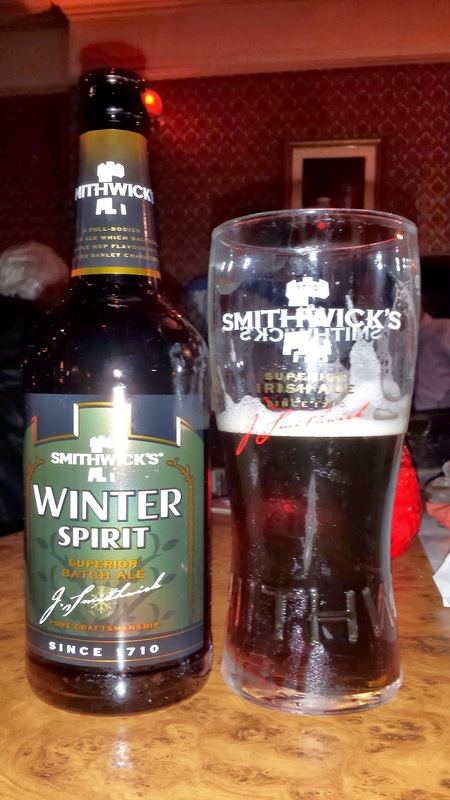 Starting off with a recent launch from Smithwicks is Winter Spirit. I was invited to the launch, a fairly low key event with about 20-30 people. I'm often amazed at the people invited to these things. They are often not only clueless about beer, they simply don't drink it! Anyway, the talk itself was by the master brewer, Alan Dempsey and that was worth attending. He basically told us the ingredients for all three beers in the Smithwicks range, the most interesting of which is the Pale Ale. How does it taste? Well to me it tasted like regular Smithwicks probably should. Basically it's the same beer with more roast barley than the regular version. It's pleasant and inoffensive but that's about it. A step up from the regular stuff perhaps. It's only 4.5% so perfectly sessionable. I was happily sent a bottle of O'Hara's DIPA to sample, by sent I mean that Seamus O'Hara saw it in the post room and brought it to me personally since he was meeting me that evening to talk about the ICBCF. I never let the bias of free beer alter what I write though. 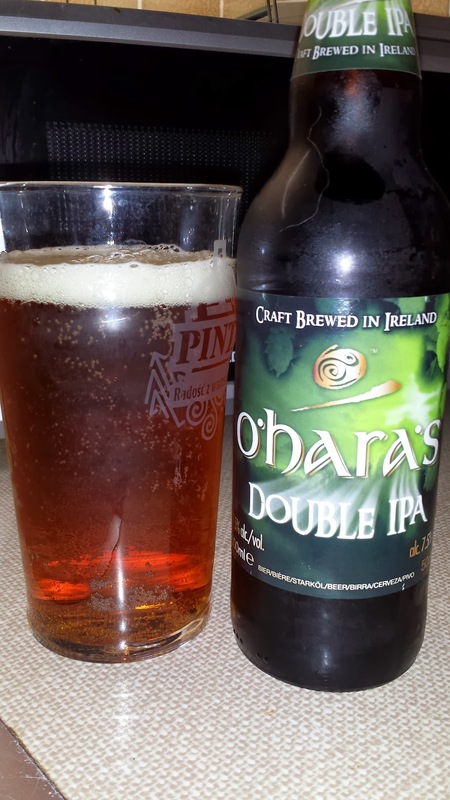 This is the first real attempt at the DIPA style in Ireland, although at 7.5% we are only at the beginning of the ABV scale for the style. The beer pours an amber colour and is clear with a white head. Aroma is caramel dominated with some citrus breaking through. A strong caramel forward body followed by a sweet middle and a fairly bitter finish with plenty of citrus and orange pith throughout. It's a lovely beer and very moreish, not to mention dangerously drinkable. The only quality it lacks is in the aroma department. The beer itself has been around since March but this is the first time it has appeared in bottle. And moving on to a beer inspired by Spinal Tap. 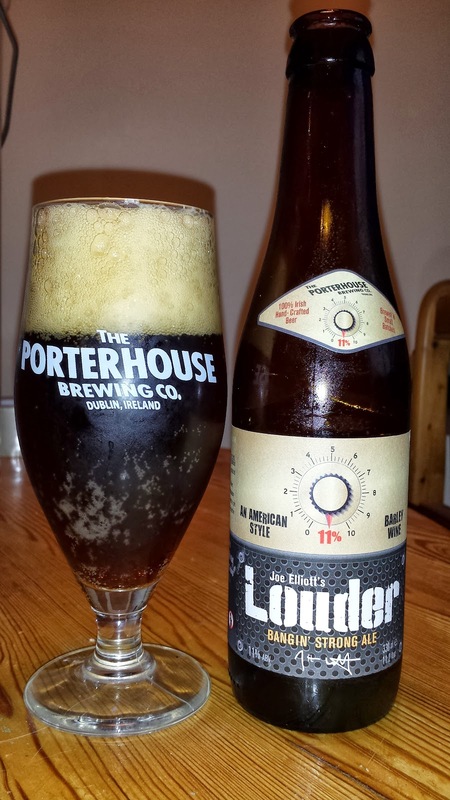 It's called Louder and is 11%. I defy any beer drinker not to get it. As is more usual when I write about beer, I bought this myself. Actually I bought 4 of them and plan to age one or two and see what they are like in a year or so. I have had louder on cask and I found it much more interesting in bottle. The complete lack of carbonation in the cask didn't seem to suit it. The beer is sticky toffee pudding with a little hop bitterness. Lots of dark fruits too. I suspect a little ageing will do this the world of good but as it is right now, it's still a lovely beer. I might crack one open at Christmas.